The Global Fund to Fight AIDS, Tuberculosis and Malaria, UN AIDS, and Carla Bruni, first lady of France, are running “Born HIV Free”, a campaign to highlight the plight of the hundreds of thousands of babies born each year with HIV. The campaign was launched in 2010 with “Baby in the Sky”, an animated short film featuring a baby invited to soar through a fantastic world of colour and variety, all to the sounds of Amy Winehouse’s track, “Back to Black”. A follow up video, “Inside”, features a pair of twins enjoying life in the womb, accompanied an instrumental version of U2’s track, “Without or without you”. After the film, viewers are invited to show their support by signing their name on the campaign’s “virtual wall of support”, on the www.bornhivfree.org website. The campaign asks people – by the simple act of clicking a button – to register their support for the work of The Global Fund and for the elimination of mother to child transmission of HIV by 2015. The campaign was developed by creative director Sébastien Vacherot. Vacherot explains the thinking behind the campaign. “I brought a wide range of films to the first Born HIV Free campaign team meetings, but the problem was that they all dealt rather negatively with the subject, whereas our aim was to bring out the positive side of the possible total eradication of mother-to-child HIV transmission by 2015. So we had to approach the issue constructively, because the medical conditions are now in place to combat HIV transmission. And it had to be done without stigmatising HIV-positive mothers. 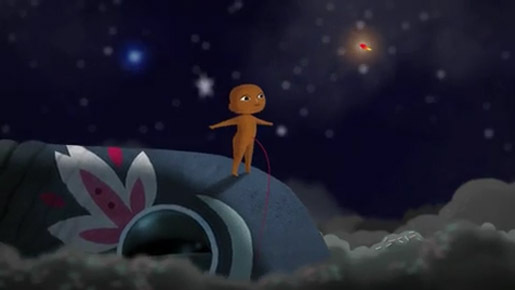 The Baby in the Sky ad was produced at Passion Pictures, Paris, by Bonzom director Jack Antoine Charlot, executive producers Marc Bodin-Joyeux and Claire Potel, animation team JSCB (Je Suis Bien Content), production manager Marc Jousset Perrine Capron, script scenario and original concept team Olivier Bardy and Jack Antoine Charlot, storyboard artist/art director Kalkaire, animators Guillaume Delaunay, Dimitri Lecoussis, Damien Barrau, Davy Durand, compositors François Leroy, Jimmy Audoin. Sound was designed at Dîner au Motel, Paris, by sound designers Michael Fakesch and Stéphane Papin. Voiceover was by Carla Bruni Sarkozy. Music is “Back to Black” by Amy Winehouse, via Universal Music. Inside was animated at Mac Guff, Paris.